Tups lndispensable created by R S Austin. Tup is the country name for a ram and this fly was so named because the thorax was made from wool from the hair on the scrotum of a ram as well as cream seal's fur and lemon spaniel's hair. So are you going to ask a farmer for the ram's scrotal hair? Maybe not! The originator of this fly was R S Austin a Devonshire fly dresser. On advice of G M Scues who rated this fly highly crimson seal's fur was later added to the thorax giving it a pinkish tinge. 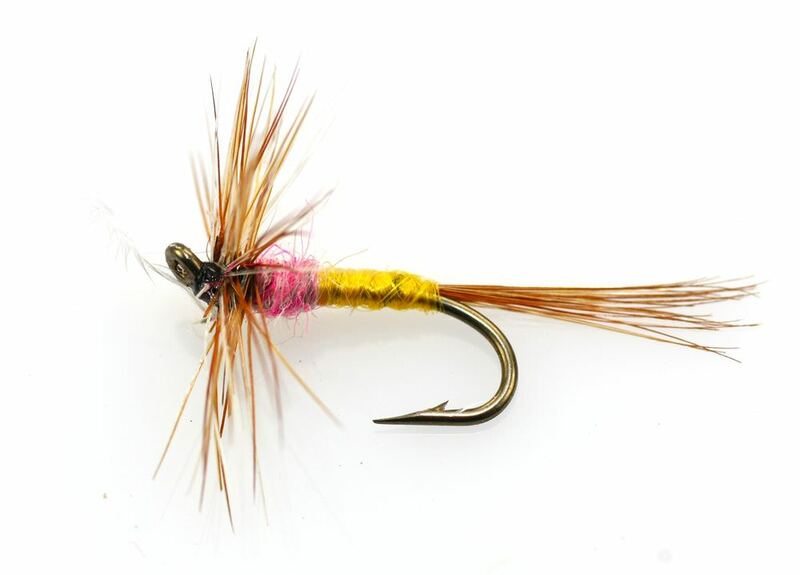 The Tups Indispensible is a great fly to use when pale wateries are on the water. For the more adventurous among you we have provided tying specifications for the Tups lndispensable. Remember at The Essential Fly we sell the Tups lndispensable at incredible prices with a top quality fly and service to back it up. It is certainly worth tying the Tups lndispensable yourself to understand the pleasure of catching a fish with your own tied fly, however at the price we sell flies it is only worth tying one or two Tups lndispensable as your can spend more time fishing instead of tying flies - buy volume online with us. Last month at 8 o' clock pm this Tup's indispensable was the best fly in my box. Simply . . .er . . . . INDISPENSABLE! A very well made Tups at a very reasonable price; and it came within the week. Very good indeed. It's called "indispensable" for a reason, don't worry about the colour scheme.